One of the first Hitachi ZW370-5s in Europe has been delivered to a quarrying company in the Eifel region of Germany.Trasswerke Meurin ordered the large wheel loader to handle lava, pumice and basalt materials in the quarry, where it started working over 150 years ago. FROM THE QUARRY TO THE HOUSEBUILDER These materials are common to the area — due to an eruption approximately 12,900 years ago that created the Vulkaneifel volcanic field — and the exploitation of the volcanic rock dates back to Roman times. An ancient mine on Trasswerke Meurin’s site at Kruft, near Koblenz, was awarded the European Union Cultural Heritage Prize in 2003 in the category for “education, instruction, training and consciousness building”. Trasswerke Meurin was founded in 1862 – when it also started work in the quarry – and today its team of 100 workers produces bricks for the housebuilding industry. The new Hitachi ZW370-5 is used in the excavation and loading process that transports the materials from the quarry floor to a crusher. The aggregates are then mixed together with cement (also produced at the site) and water, before the bricks are prepared and packed on pallets, ready for onward distribution. The high- quality products are sold to builders merchants within a 400km radius of the quarry, including exports to The Netherlands, France, Belgium and Luxembourg. The ZW370-5 has been fitted with a large 5.6m3 bucket that has been customized by German Hitachi dealer Kiesel with a blade below the teeth to suit the demands of the site. The teeth are suitable for penetrating into the rock, while the blade is used for cleaning up the stockpiles and levelling the ground for trucks. 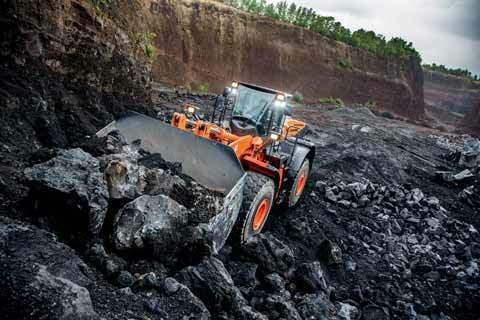 In addition, Kiesel supplied the large wheel loader with a 48-month, 6,000-hour HELP extended warranty. The machine also benefits from a double cab air intake filter, central lubrication and load indication systems, as well as heated mirrors, a belly guard and additional lights. His responsibilities include the purchase of new machinery and he adds:“We are very happy with the quality and low cost of ownership of the Hitachi wheel loader. The decision to buy this machine was due to the high level of service that we’ve received from our supplier in the past and the excellent value for money that it represents. Phil also considers the opinion of the operator to be very important, especially an experienced employee such as Markus Hoffman. He has worked for Trasswerke Meurin for his entire 22-year career and says:“I recommended that we should buy this machine because of the engine capacity, tipping height and overall design in comparison with other wheel loaders.